Matting is the term used to describe the ‘window cut’ placed around an image within a frame. Mats serve as a spacer to allow your artwork to expand and contract with changes in humidity. 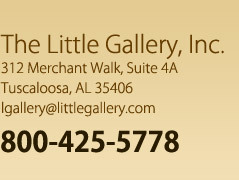 The Little Gallery carries major brands of mat board including Crescent, Artique, and Bainbridge. We offer a vast array of colors, fabrics, and textures (including suede, linen, and silk) to ensure the right look for each piece being framed. Using our Wizard, a state-of-the-art computerized mat cutter, we are able to create personalized and unique designs, as well as complete large scale orders in a prompt manner.